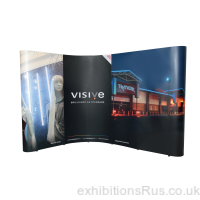 The ever popular pop up display stands, offered for purchase online, in stock and ready for your order at competitive kit prices which include lighting and a wheeled transport case. 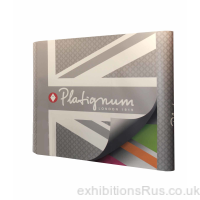 The pop up display is a collapsible framework like an umbrella, magnetic bar or click fit bars are then fitted to the pop up frame work to create a rigid structure to receive your magnetic graphic panels. 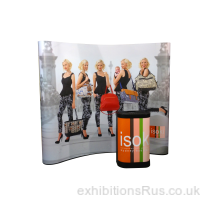 We can create pop up display stands that are curved and straight with graphics to front face, rear or both. 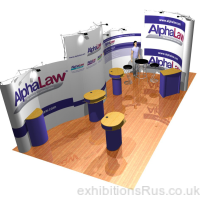 We can also link popup stands to form freestyle shapes, right angle walls, petite low height popup stand, even raise there height by adding an extra quad. 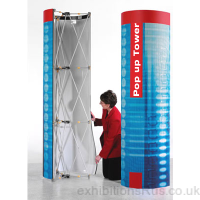 A professional solution for rapid assembly and exhibiting needs, ideal for all promotional applications and events. We can even add in optional shelving units with lights, maybe a bubble panel or a transparency graphic for one of the drops or a Vesa mount to carry a small LCD screen. 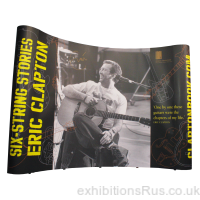 Fabric and graphic style pop up displays are dispatched within 4 days, or less after sign off of a test print sent to you for checking colour output. 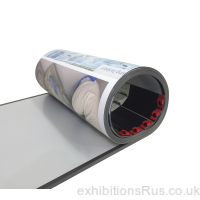 As with all our products the group aim to produce top quality reliable popup units, we use pigmented dye inks which are said to be stable for 100 years according to the manufactures under normal display conditions. Graphics are printed to plastic stoplight medias and laminated to produce extremely durable graphics that you will be delighted with. Our Pantone matching is very accurate but you should advise us of any specific colour match requirements with your order. 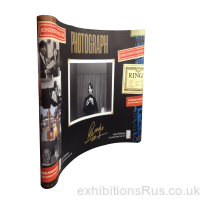 Any questions or advice on pop up display stands, please do call on 01256 768178.